The 49th AGM of the Berwickshire Civic Society was held last week at Thirlestane Castle. 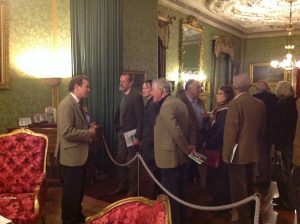 As the Society look ahead to its 50th anniversary the meeting heard how Thirlestane Castle Trust is positioning itself in the 21st century. Edward Maitland-Carew, Resident Trustee of Thirlestane Castle Trust, gave a talk to Society members explaining that the forced closure of the Castle in 2012 due to extensive dry rot, allowed Trustees time to consider how the business could be made financially sustainable to meet the demands and expectations of the modern visitor whilst also preserving the Castle and its collections for future business’. 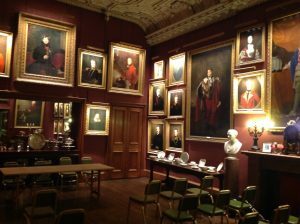 The AGM was held in the State Dining Room which holds one of the largest collections of family portraits in Scotland. The Trustees decided that they needed to diversify their income generating stream whilst also conserving and promoting the heritage associated with the building, its contents and grounds for visitors. The successful application for match funding from LEADER is enabling the Trustees to carry out the first stages of the plans. Society members were shown the new event space in the Victorian Kitchen for weddings , private dining and groups, which can cater for up to 40 people. Together with upstairs servers which enables the State Dining Room to be used more easily for functions.